These fires are terrifying in its size and fire trucks are so small. In 2009 173 people died in the fires, the highest number ever. But in 1851 in the month of February fire ravaged five million hectares of land. This year, about 200 000 ha have been damaged by fire so far. It is hot, dry and plenty of combustible material om the ground. What has happened is unfortunately nothing new. 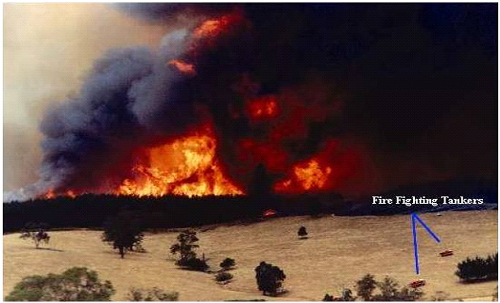 When I traveled in Australia Jan / Feb. 1975, I learned that there had recently been major fires even in Tasmania. In rural areas, people have no wells because the water is salt. In the country there are at each house large water tanks in which they collect water from the roof and then use it for drinking water. There were the people who had not had time to go away from the fire and to save themselves they crawled down into the water tanks. Unfortunately, instead they were cooked in these tanks. So severe was the fire. 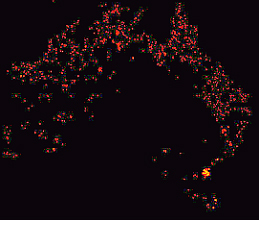 Image source http://home.iprimus.com.au/foo7/firesum.html and on this site you can find some statistics of severe bushfires in different years back to 1851. 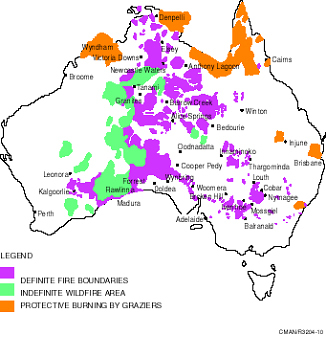 In which area are most bushfires? According to this map the most are in the northern parts. The other map shows the area burned in 1974/75. 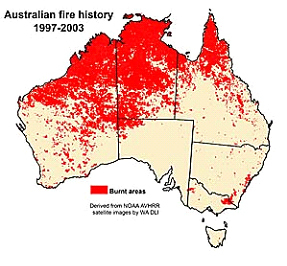 Read more on this site about the Australian fires. Sometimes it burns so much that you can see the outline of the Australian continent from satellites. This satellite photo is from 2006. The vegetation survives because it has adapted to these fires. There are even tree species thet would die out without these fires. 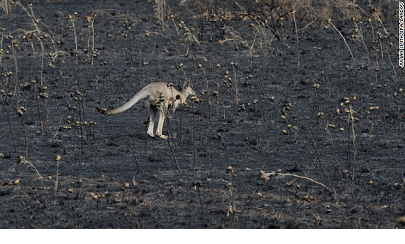 Nowhere in our world, has nature adapted so much to the fires as in Australia. And the animals then, well see below in the picture. Most survive.